These fridges are a collaboration between two iconic Italian brands – Dolce & Gabbana and Smeg. 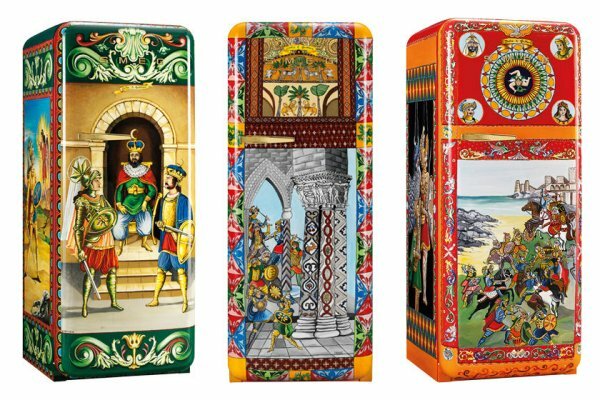 Created by using the Smeg FAB28 fridge with its retro style and pastel shades, Sicilian artists have hand painted different scenes and created 100 vibrant and evocative fridge designs, using images such as fresh lemons, the trinacria flag, battle scenes and medieval knights. Tapping into the consumer megatrend for bespoke, personalised products, the fridges each took 240 hours to complete and are for sale at £30,000 each. The collection is part of a ‘Made in Italy’ initiative which celebrates ‘family tradition and the importance of maintaining local roots’. The fridges will be presented during the Salone Internazionale del Mobile 2016, taking place in Milan from 12 to 17 April.